For the longest time I have wanted to make a bedside table, because at the moment I have been using my yoga mat as a place to for my phone to sit at night while it charges. On the day that I decided to begin working on the design for my bedside table, the artist Tom Sachs released his “Shop Chair” for sale for $2000 on his website. I have been a massive fan of his work and process for a very long time and took his chair as an inspiration and jumping off point. I replicated the design of the chair’s legs as best as I could in Vectorworks, as I also am hoping to make the chair myself soon. From that design I reformatted it to fit the dimensions that I have available to me as a bedside table - 24 H x (15x15) W.
The first goal I wanted to cross was to cut tests of the legs that would friction fit together without the need for glue, and I would work out the table top portion later on. I had some leftover wood from The Box that I could use for tests, as I wasn’t the nicest ply and was a bit rough, but it was just about the same material thickness overall with the polished birch ply I got from Home Depot. There was a good bit of working through the kinks of the new spoil-board bowing, as well as my wood not being the most flat after sitting in the shop for 3+ months. I wasn’t cutting through deep enough on my test cuts, and at a point I paused the job and there was a cutout of power from something else in the shop and my job lost all zeros. Thankfully I had written down the distance of my drawing from the page center in Vectorworks, so I found the first circle that was cutout, and drew a line from the Bottom Center point of it to the page center. It was at a 30 degree angle and about 5” from the page center, so I grabbed a compass and ruler and and marked that in my material to be my zero. I was just off by 1/8 of an inch to the right. Once I completed the cutting and joining of the test I went about designing the tabletop portion of the bedside stand. I found this bedside table on etsy that I liked its use of a hexagonal shape. The cutting of the final piece went without any issues. The pre-polished, cleaner plywood I got from Home-Depot was the same width as the test material I had somehow, and the designs didn’t need to change too much, outside of the arm I designed for the tabletop to sit on. Even though I used all of the screws I had available to mount my wood down, the second piece of wood had about 1/32” of material left so it needed a little TLC. I sanded all the sides just a bit and the snuggly fit together like a breeze. I first used the mallet to get the legs together, but then moved to a trigger clamp to close it up. I got the top on but felt that I would snap the arms if I didn’t give them any support. I turned the piece over, placing the tabletop portion on a table. I took one of the Jorgenson clamps and one of the leftover circles to finish the clamping. So extremely satisfying watch that last gaps of air disappear. Overall I am extremely pleased with this piece. Danny Rozin gave me some great comments about the design of the arms and I plan on redesigning it down the line. For the first assignment on the big CNC, Nick Gregg and I decided to work together again. We initially set out to route the same form we hand routed but were quickly overwhelmed when setting pocket directions on the CAM. We chose to take one form from the many and add some text to explore the many ways the router can be used. As detailed at the end of the documentation, we were unsuccessful in routing out the whole circle. We attribute this to the thickness of the region that wasn't cut through — the measurement taken prior to milling was 0.635 — the exact depth that we were cutting (as specified through CAM’s “ cut through” menu — 0.05 depth. At that point we debated setting the zero origin z slightly lower and re-starting the file. We decided against this in fear of damaging the bit. This did bring up the question: what is the proper procedure when this situation happens? In July 2017 I was on a cross country and one of my favorite spots that I visited was Monument Valley. In the visitor center of the park there was sculpture of the silhouette of the two definitive structures of the park, West and East Mitten Buttes. I always had thought of ways that I could use this piece as an inspiration. I had found some really nice 15 ply plywood that I wanted to use for this project, but as the day went on there were too many people on the Othermills for me to get to my final ply, and I ended up just sticking with my test runs. This was my first time using the Othermill Milling Machine. We were given a skill builder but I had seen a photo on my phone of sketches a friend of mine had done and wanted to make on of the sketches. I happened to be near Canal Plastics last week and snagged one of the small 2x2” acrylic. I had to play around a lot with the sizing and the turns for the character as the 1/8’’ bit can only handle so sharp of turns. Thankfully since you can update it in the Bantam app it made playing with the corners so much simpler. 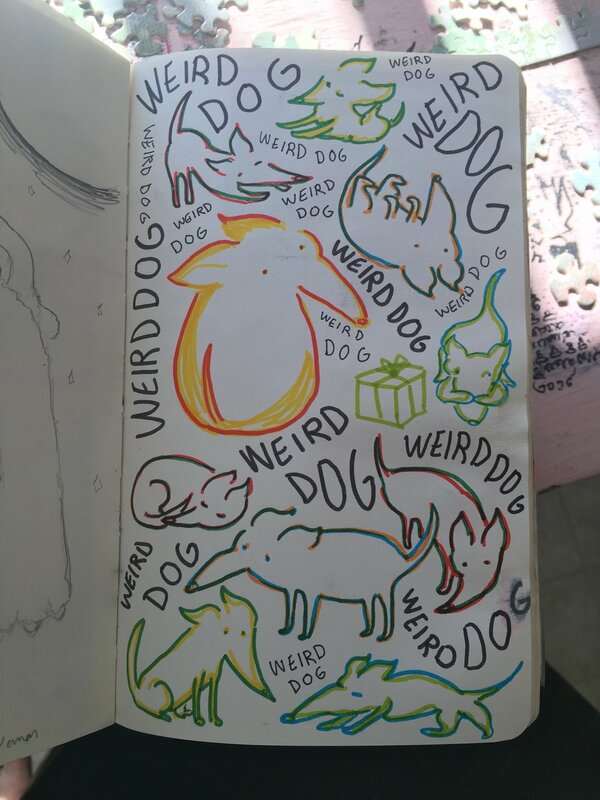 I think I’m going to try to make a series of these Weird Dogs and send them to my friend, but I will size up on the acrylic pieces and maybe get some smaller bits. Nick Gregg and I decided to work together on the Hand Router assignment. We went through the skill builder, trading off turns routing the piece of wood. Once we had cut out the general design of the circular shape, we decided to sketch with the router throughout the inside of the shape. These photos got out of order towards the end, sorry. This is me testing the blog function on my squarespace site.